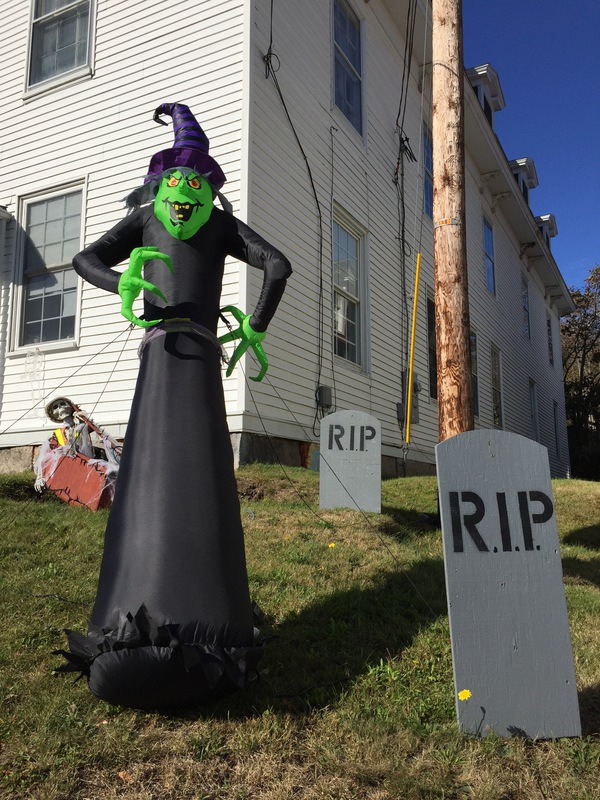 We’re getting ready for Beggars’ Night in Columbus, but that’s just part of what has become an increasingly big, and prolonged, celebration of Halloween in America. 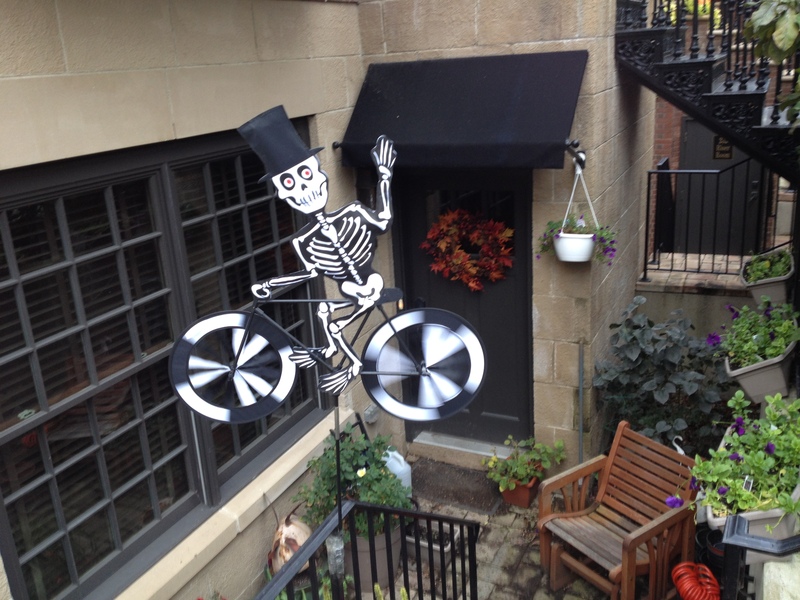 In German Village, we’ve already had an adult trick or treat night that gave “grown-ups” a chance to don costumes, act like kids, and go to designated locations where they could have special drinks and eat Halloween food. If you turn on your TV, you’ll see lots of commercials about preparing special Halloween-themed foods, decorating your house with spiders, fake cobwebs, and other scary stuff, and making or buying elaborate get-ups for your kids. 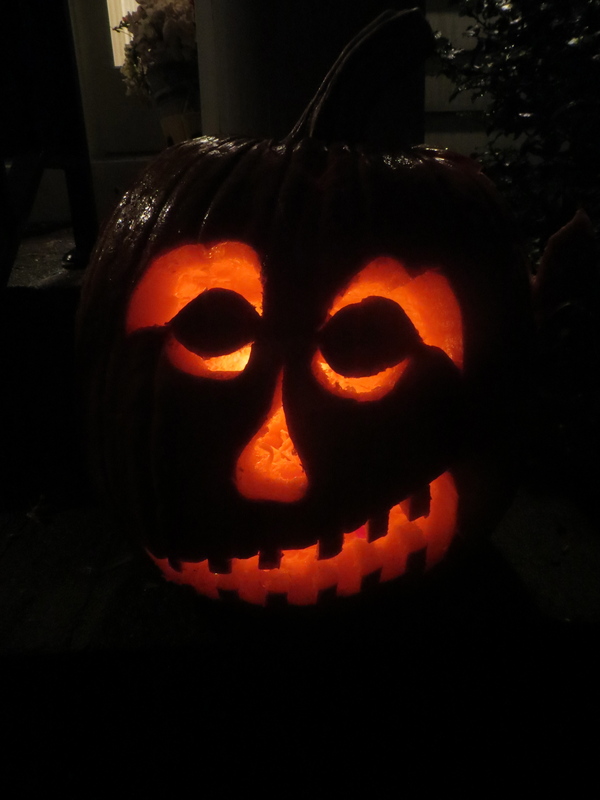 It all reflects the reality that, every year, Americans spend more and more on Halloween. It was . . . different during the ’60s. Halloween was almost exclusively a kid’s holiday in those days; I don’t remember adults being very involved or all that interested in participating themselves. Most of us kids came up with our own costume ideas and made them ourselves, because there weren’t a lot of other options — you could buy a cheap costume from the local store, but it was impossible to see or even breathe in the hard plastic mask with a slit for the mouth and little holes for the eyes that was always of the package, and the flimsy bodysuit part of the costume was ripped to shreds almost immediately unless you stood perfectly still, like the unfortunate kids in the photo above. After one year where I, too, went as Batman and wandered around with a sweating face, unable to see or make myself heard clearly, I decided that the homemade costume route was definitely the way to go. I don’t remember much about the costumes I made, except that they were pretty simple. One year UJ, Cath and I went as three of the four Monkees — I think I was Mickey Dolenz, my favorite Monkee — but our costumes didn’t matter much because it was unseasonably cold for trick or treating that year and Mom made us bundle up to the point you couldn’t see our Monkee outfits, anyway. One year I was a pirate, one year I donned a jersey and went as a generic “football player,” and another year — I’m embarrassed to admit — I went as a “bum,” putting on some beat-up clothing, a battered hat, and smearing some of Mom’s mascara on my chin to give the appearance of unshaven beard stubble. The hobo outfit was common in that pre-PC era and was an easy costume to make and blessedly mask-free, but I’m guessing that nobody goes trick or treating as a “bum” these days. That’s one of the many ways in which Halloween has changed since I was a kid. One thing that hasn’t changed: kids still want chocolate to put into their trick or treat sack. No apples or popcorn balls, please! I was walking down Parsons Avenue this morning, heading toward the Ace Hardware store, when I noticed this sign. It is a memorable one, with a seriously creepy element to it, too. 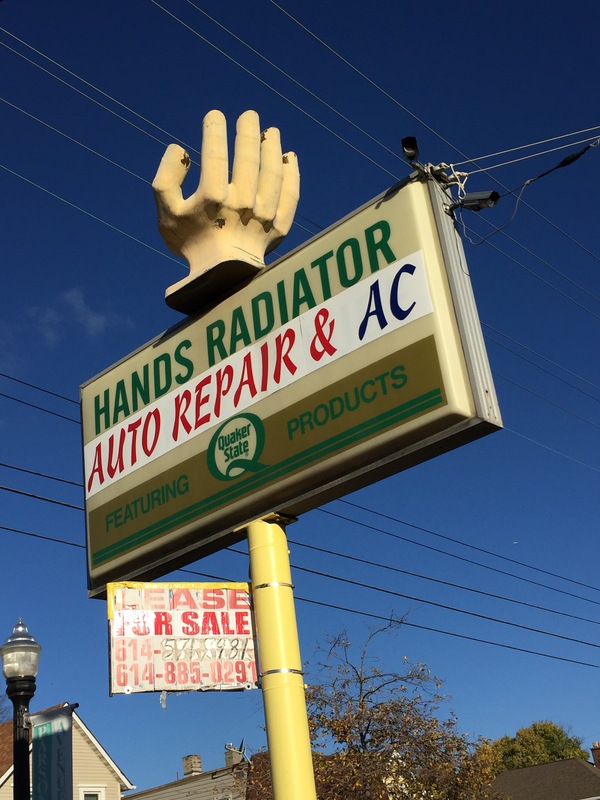 No one wants to look at a disembodied hand, really — but It harkens back to the ’60s, when many signs featured folk art elements that sought to make the business memorable. In those days it wasn’t unusual to see fiberglass cowboys, spinning globes, and neon martini glasses as you drove down Main Street. 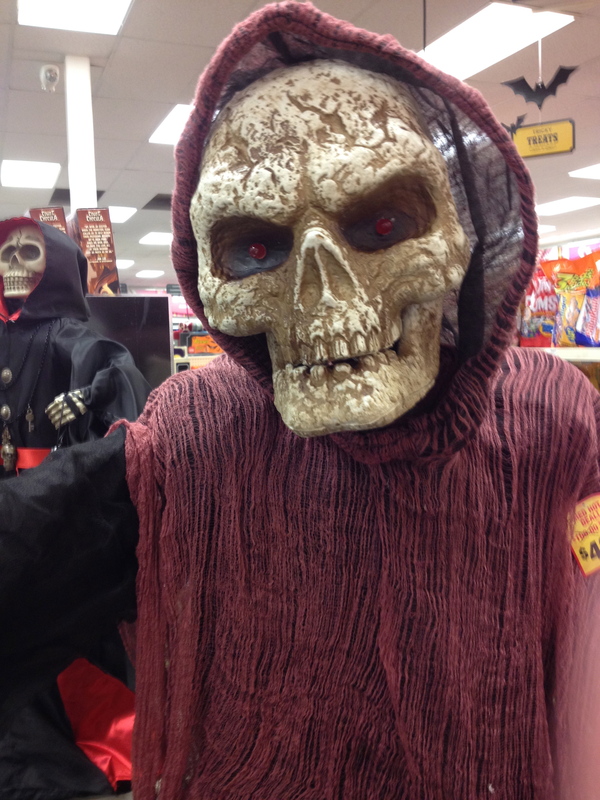 Based upon the decorations in my neighborhood CVS, you’d think that Halloween is right around the corner. Of course, it’s a full four weeks away. Four weeks! I’ve gotten used to Christmas stuff being rolled out ridiculously far in advance of the actual holiday, but I didn’t think Halloween had become a month-long process, too. Apparently I was wrong. Sigh.